Galfar Engineering & Contracting SAOG (Galfar) is Oman’s largest construction company with EPC capability in Oil & Gas, Roads & Bridges and Civil & Utilities sectors operating in Oman, other GCC countries as well as India. Over the last 40 years, Galfar has established itself as the “Preferred Partner in Development” in Oman with a turnover nearly USD 1 Billion. The Company has grown steadily over the last 4 decades, owns a fleet of more than 7000 equipments, employs a workforce of over 23,000 and also prides itself as the largest employer of Omani nationals in the Private Sector. The Company’s endeavor towards excellence in construction quality, safety, performance, employee satisfaction and social responsibility has enabled it to be the most trusted and sought after Engineering, Procurement, Construction, Operations & Maintenance and Project Management company in the region. It has consistently delivered projects, providing value-added engineering, construction and service skills to customers for whom the quality of execution, efficiency and reliability are critical. 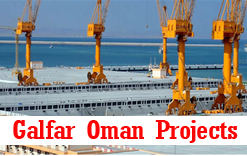 Galfar Engineering & Contracting Company required staff for their upcoming projects in Oman.